Do a little steeping and straining, boiling and stirring, rolling and cooling. Voila! Your very own cough drops at half the price and just as effective as the commercial ones. You need a candy thermometer to make these. 1. In a saucepan, pour 3 cups boiling water over the horehound leaves and steep for 30 minutes over low heat. Strain into another saucepan and add the brown sugar: stir until the sugar dissolves. 2. Bring the mixture to a boil and boil until it reaches 295 F on the candy thermometer. Stir in the eucalyptus and tea tree oils. Let cool slightly, then, using buttered hands, roll into small balls and let the balls harden on wax paper. Wrap them individually in plastic wrap and use as needed. Here are some pics of Charlie Sr. (Susan's husband) and their son Charlie Jr. at his first Broncos game. He is so into the Broncos and football this year, so we splurged and got tickets. We were a little bummed they lost, but the boys still had fun :) Driving to the field. Charlie Jr. and Charlie Sr. This time of year many people want to help others. A great site is http://www.volunteermatch.org/ . You can search by location and area of interest. You will find a huge selection of varied opportunities. 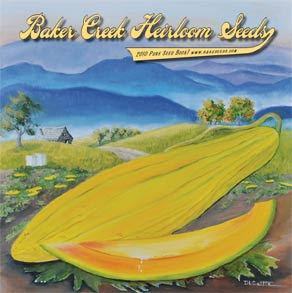 I got my Baker Creek Heirloom Seed catalog today :) from http://www.rareseeds.com/. I love this time of year, get my catalogs and start planning my garden, even tho it's cold out right now! 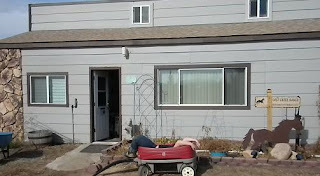 I am gonna build some raised beds and have lots of fresh veggies to can at the end of harvest time. With winter sometimes my hair gets dry-so I found these natural remedy and thought I would share it with you. To keep your hair in top condition, try massaging a few drops of oil of rosemary into the scalp, then rinsing with an infusion of nettle. You can also take your favorite conditioner and massage it into wet hair and wrap a plastic grocery bag around your hair for ten minutes. For very dry hair, warm two T of olive oil in a cup placed in a pan of hot water. Massage the oil into the scalp. Steep a towel in hot water, wring it out and wrap it around your head for about two hours. Rinse with a solution of half a cupful of cider vinegar to 11 cups of water. 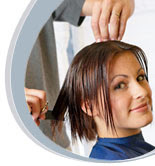 To make an egg shampoo for dry hair use 1 T of fresh rosemary, 2 1/2 cups of hot water and egg. Steep the rosemary for 20 minutes and allow to cool. Beat in the egg and massage into the hair and rinse well. Here at the ranch we have adopted a former PMU (Pregnant Mare Urine) mare. These mares are used for their urine to make synthetic hormone replacement, and these mares are treated very poorly--kept in a pen all of their lives, catheterized and in a constant state of pregnancy. The babies are soon taken away from the mom and killed. Our natural progesterone cream is made from plant based hormones--so you can feel good about using it, and we will keep you posted on Honey's progress. What a beautiful, warm Colorado day. Hard to believe we were under blizzard conditions less than a week ago when it is 70 degrees out today. 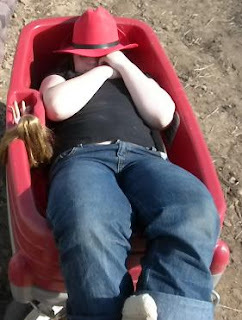 Here is Megan out sunning in a wagon. 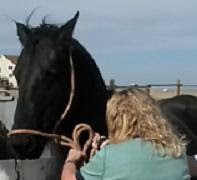 Laurie is going to spray her Friesian mare with some SOS-natural pain relief spray for animals...Franca has a sore hoof. Now I am only 5'2" (on a good day) so climbing through the drifts to feed these horses can wear me out! LOL and to think some people have to go to the gym to work out. So I got them fed, but we have a wood stove and of course we weren't prepared, so there I am digging out wood from under a nice large drift to put on my sled and pull back up to the house. I have an Alaskan Malamute and a German Shepard and they are just cocking their heads to the side, looking at me like "what are you doing?" Need to turn those 2 into sled dogs! I get a nice fire going and just in time---the power goes out! What a day! and do you think our Y2K generator is hooked up? NOPE....lol. Wish I had pictures. What a riot! Ashley Marie was born Oct 7 weighing 7 lbs 8 oz. We've been busy here at Natures Light. We moved into larger offices and we are EXCITED! We needed the extra room for sure :) We are working on the last touches for our new product SOS-an all natural pain reliever for pets. Natures Light is a small family owned company. Laurie, a master herbalist, started Natures Light in 2000 with her daughters-Susan is an RN, Jessica holds a bach. degree in Psychology, is an LPN and is working on her RN, and Wendy is studying to be an APT. We operate out of beautiful Bennett, Colorado and love to hear how our products have helped people from around the world, so follow us in our journey on this blog.